Seeing David Live…wait, Hearing David Live! Man, was I blown away! Just the sound check had my heart pumping! To be in a small venue with David Archuleta only 10 to 13 feet away was just “too much.” I literally felt the beat thumping throughout my body, from my feet to my heart! I had not seen David live since August 2008. The greatest part about this time was that he was singing songs that were his own—some new, some ‘old,’ but all gold! Note: click picture to see larger version. David was no-nonsense during the sound check and very pro­fessional getting the musical instruments coordinated to his voice and liking, but then he would give his fans a heads-up or a shout-out and we’d all scream for more! David chose to sit on the edge of the stool but he could not sit still as he got into the song. I was afraid the stool might fall over, but David is very corordinated. This song has a wonderful catchy tune! Wow! Hearing SBL live was a dream come true. This is David’s first single from the new album, The Other Side of Down. The music video for it was amazing, so I was hoping he would sing it. This one really got all us fans jumping and screaming. This song is so David and I believe he really enjoys singing it. Again, just perfect with a few surprise twists! It was shocking to me how David did this with all the songs and didn’t miss a beat. How does he ever remember all these different twists in a song? His natural musical talent makes him a great live performer. 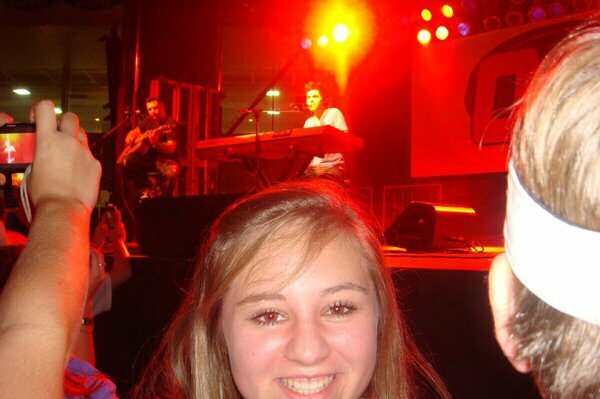 During “Touch My Hand” I got to witness first hand how it is to be 16 and have your arm touched by David Archuleta! Becca (beccakayy) was so completely enraptured by David as he reached out to touch the hands of fans. Later, she saw the photo her mom had taken, confirming that David had indeed touched her arm! It thrilled me to see someone else show how much she cared for this wonderful artist. I think SOT was a freebee because there was something going on with the keyboard and the crew had to come onstage to work on it. To kill some time David stood back up and gave us this wonderful treat. I love this song and I believe it’s my favorite. The words are just incredible and hearing it live just thrilled me! Oh, my! What a thrill to hear this brand new song which will be on the new album. Written by David and his guitarist, Mike Krompass, this is David’s latest single. Back at the keyboard, David gave us “Crush” and I was just blown away again! It hit me why David is so well-known for this song. It has been running in a loop in my head for about a year now, but hearing David sing it live gave new meaning and beat to this song! David listened to all us fans out there and sang one more even though Mike, the guitar player, was on the way off the stage. When David sang “God Bless America” a cappella, it brought tears to my eyes! I couldn’t believe that after all the videos that I’ve watch with David standing in an arena singing this song that now I was getting to hear him live! Amazing last touch!! And then he was gone. All too soon! 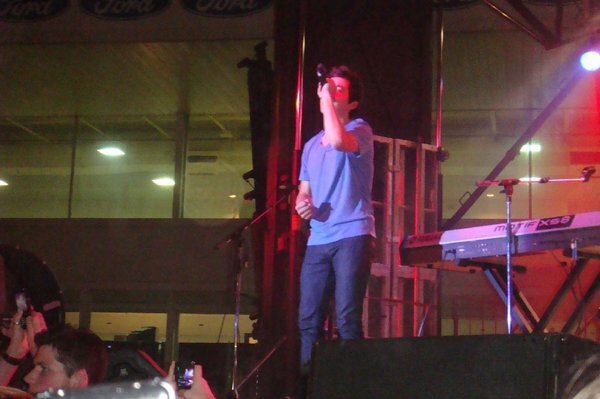 Many people at the Delta Fair commented on this one thing: David will be around for as long as he has the desire to sing. I’ve thought this since I first heard him more than two years ago. As I looked at the audience last night, I could tell one reason David has longevity as a performer: his fans range in age from two years old to 99. And there are more than 99 reasons people love David and his music. So long as people love music and true vocal talent, David will have a captivated audience. His talent is awesome. How can he sing so beautifully and make his fans feel every chord on an individual level? Each high note and every low one makes us feel the gift and the power of music. Yes, I’ve been following David since Idol 2008 and I can foresee a great future for him and his fans! This Post has earned 10 Buzzes. What a great post. Just watching the videos from the Memphis Fair had me enraptured, I can’t even imagine how wonderful it was to be there. I think attending an acoustic show like this one would be the best concert ever. I’m planning on attending the Albany Classic and I can’t wait. Oh kimbee… even if the week is not going as you plan Please do whatever you can to see David LIVE in Albany! It will end the week on a wonderful note and you will feel so much better for it…. I will be praying that your plans will work out. Up to the weekend I had told myself all kinds of reasons why I couldn’t go to the Delta Fair…but then thank-heavens I heard the snippets of his new song on dabuzzing and that changed my mind. David was worth all the trouble of getting there! Thanks for your comment about my post. And of course I’ve left out soooo much!!! 3cota, I’m flying from Texas to Ohio so I’m planning on being there, I just couldn’t wait any longer to see David and I didn’t know if he would come any closer so I just jumped in and booked a flight. Of course the very next day, they announce the show in Kansas which would have been better for the budget but that’s how it goes in this crazy world of David. I noticed your story was brief, so feel free to tell us every little bitty detail. We love to live vicariously through other fans. Thanks for your great stories, 3cota. And the photos. Becca is so pretty. I wonder if she has washed her arm yet. beccakayy, great to see you here… I just love the pictures you took of David. You guys did a great job with capturing him while he was singing and I know it was a hard angle to work. (I was fortunate enough to be standing behind you…and we were only a few feet from the stage). Hey beccakayy, if you remember the line up of the songs that David sang that night… could you post them here on dabuzzing? I’m thinking I left out some and I’m sure my order is wrong. 3cota, between Mom and me, we sure did get some good ones! We will have to give you a CD of pictures for sure! Thanks beccakayy… I first left out My Hands but then added it later in a post by itself. I thought there could have been another one I missed. I know your mom wanted David to sing “You Can” really bad. I would have loved to have heard that one too. David is amazing! I would love a CD of the pictures and video… if that is possible. I too was hoping for “You Can.” I haven’t heard him sing that in quite a while. Yes mam, well Mom said she emailed you the other day, but she was worried that it didn’t send or she had the wrong address… She said she’d try again though. But we can definitely send you a CD! !